This article is intended for readers who are already familiar with DirectX 7.0 and want to move on to DirectX 8. It is assumed that the reader has knowledge about the graphics pipeline, simple matrix math, flexible vertex formats and other aspects of DirectX programming. Before getting along with the DirectX 8 pipeline, let's go back in time and take a quick look at the DirectX 7 pipeline. Had to set and reset lot of states. No control over the vertices once it enters into the pipeline. The TnL could do all the transformation and lighting by itself (without any CPU interaction), and we had no control over it. 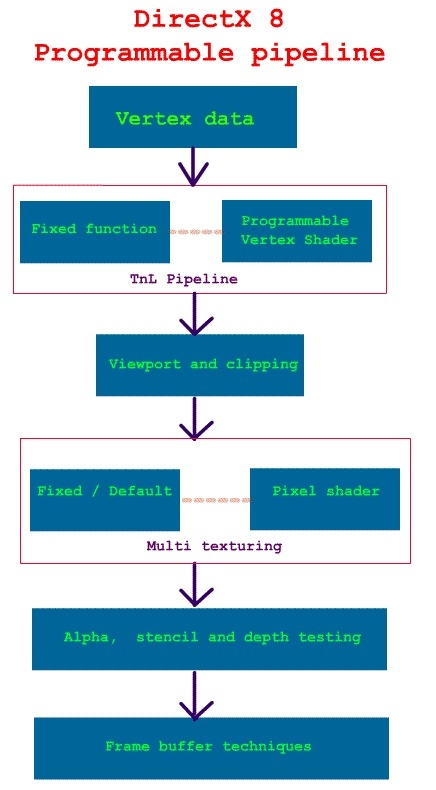 Features of DirectX 8.0 programmable pipeline: Vertex shader is that part of the graphics pipeline which gives the user the power to do his own custom transformation and lighting without sacrificing any speed. It takes an input (flexible) vertex which has properties like position, normal, color, texture co-ordinates and outputs the vertex in the CLIP space. You have complete control over the transformation and lighting part of the pipeline. Do your own lighting using your own custom lighting model. Freedom to choose between fixed function and Programmable function pipeline. No need to set most of the states if programmable shaders are used. What can you do with the vertex shader? Generate texture co-ordinates on the fly. What you cannot do with a vertex shader? Cannot do any polygon level calculations, since we are unaware of the other vertices. Cannot modify any vertex data other than itself. The numbers of registers are not going to remain the same. In fact the table given above holds good only for the current generation of video cards like GEForce3. You can query the number of available vertex shader constant registers by using the function GetDeviceCaps. 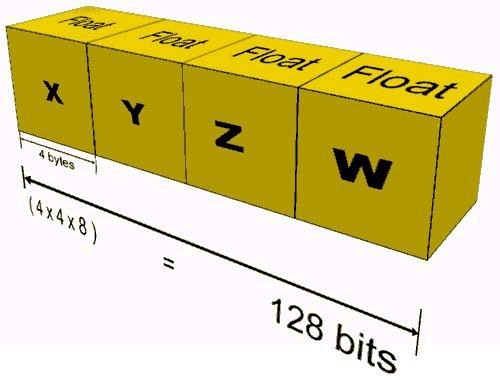 Each register can hold upto 4 floats, i.e, 128 bits. 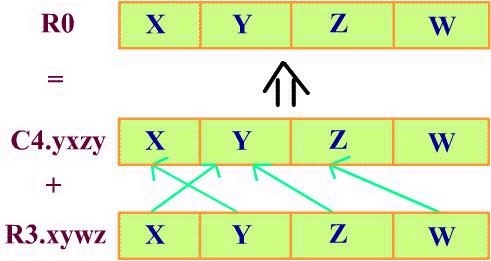 Visualize each register as having x, y, z and w components. oT0 to oT3 = Upto 4 texture co-ordinates. One for each hardware texture unit. Address: A0. Only x component can be used. GPU uses SIMD (Single Instruction Multiple Data) technology. 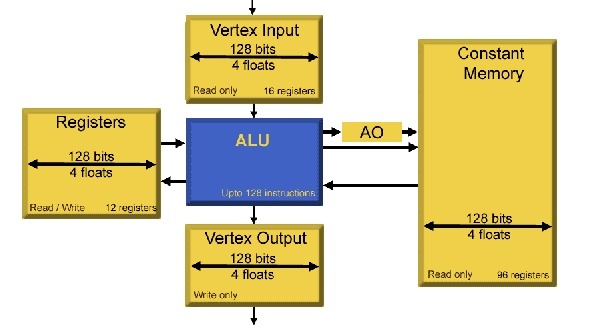 All operations are done on the GPU when using HARDWARE_VERTEXPROCESSING. If using SOFTWARE_VERTEXPROCESSING, then the GPU is simulated on the CPU by DirectX using processor specific optimizations. Obviously, it's not as fast as the GPU. If you are debugging your vertex shader code, then, it is a must that you use software vertex processing. There is no performance gain if default shaders are used instead of programmable vertex shaders. In fact, it's advisable to use programmable vertex shaders. GPU is faster than the fastest CPU. Watch SIMD devil at it's very best. Vertex shader code usually sits on the card. Hence, not too much time lost between shader switches. Almost all instructions take only one GPU cycle to execute. Lot of registers available to play around. Operations are done on a per-vertex basis. What happens to the vertex data after it leaves the vertex shader? Click on any of the instructions to see their details. Instruction Expansion (in English) Execution time in GPU cycles. Computes the dotproduct with 3 components. Computes the dotproduct with 4 components. Computes lighting coefficients from two dot products and a power. Set if greater than or equal to. First sentence expands the instruction in English. Second sentence is the instruction format (in bold and italic). Instruction	format is OpCode followed by Operands. Like Intel format, destination (register) is always preceded by the Opcode. Any	sentence after this explains the instruction in more detail. All	opcodes and operands are in italic. �n�	in an operand means any one of x, y, z, and w.
Used as a place holder. Multiply the contents of src1 and src2 and put the result into dest. src1and src2 can also be dest. � mad: Multiply and add. 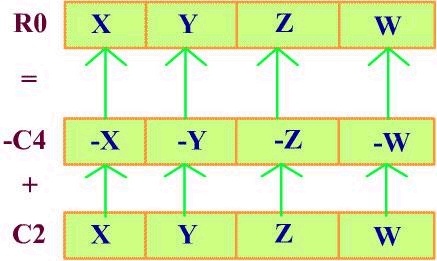 �n� has to be one of x, y, z, and w. if n is not specified, then, it is assumed to be w. Calculates the reciprocal of square root of a number. Used extensively in calculating distance, normalizing vectors, etc. � dp3: Computes the dotproduct with 3 components. � dp4: Computes the dotproduct with 4 components. This sets dest to (1.0f, d, d*d, 1/d). Does this look like what is required for the distance attenuation calculation. Well, exactly. � lit: Computes lighting coefficients from two dot products and power. Sets the destination to the lower of the values in the two source registers. Sets the destination to the higher of the values in the two source registers. � slt: Set if less than (component-wise). � sge: Set if greater than or equal to (component-wise). This translates to dest= (src1 >= src2) ? 1 : 0 in C.
� rcp: Reciprocal of a number. Allows us to do division. Some instructions have limitations on how the registers can be used. will give an error that the maximum number of constant registers add can read is one. You can swizzle the components of the register. Destination register can mask which components are written to. For assembling a vertex shader, you will need the vertex shader assembly source and its declaration. The declaration describes the (flexible) vertex format. You can create your vertex shader in two ways (that I know). 1. Write the assembler as a string with each complete instruction terminated by a new line character. Use the standard DirectX function to assemble the shader and to create the shader. This is pretty rigid and does not support macros. 2. Write the assembler code in a text file and assemble using the NVidia� assembler (available on the NVidia web site). As you see, this is very flexible and supports macros. You can assemble your vertex shader code by using nvasm.exe. You have instructions (damn good ones) to perform all the TnL vertex operations. Instructions tailor made for vector, matrix and lighting math. Up to four data (components) can be manipulated simultaneously with a single instruction. Up to 128 instructions can be encoded in a single vertex shader. No conditional instructions. They have been sacrificed for speed and performance. Take advantage of the free negation and swizzling. Pause and think before using a mov instruction. Much more can be done by other complex instructions and at the same cost. Vectorize operations wherever you can. The performance of your code is directly dependant on the number of instructions in your shader. Make use of complex instructions like mad, dst, lit, etc. wherever possible. Try to keep data in multiples of four. Like four lights, four blending weights, etc. While setting vertex shader constant data, try to set all the data in one SetVertexShaderConstant function rather than multiple calls. Try to batch drawprimitive calls in such a way that some common constants need not be set again and again. If you are doing some calculation which is per object rather than per vertex, then do it on the CPU and upload it to the vertex shader as a constant, rather than doing it on the GPU. Ex. (World x View x Projection) matrix. In this section, we shall see how surfaces are shaded based on position, orientation, and characteristics of the surfaces and the light sources illuminating them. First, let's begin by discussing different kinds of light sources (of course, the only source of light for us geeks is the monitor) that are in practice today. This is in increasing order of computation complexity. 1) Ambient light: As the name suggests, this light is present everywhere. This light is a result of light rays being reflected multiple numbers of times by many objects in the ambience. We can never determine the exact source of light. Since this light is present everywhere, it affects all the surfaces with the same intensity. 2) Directional light: This light has only direction (orientation) and color. A very good example of directional light is sun light. The source of a directional light is assumed to be at infinite distance from the object / surface. 3) Point light: This light has position and color. A good example of point light is your light bulb. Rays from the point light eject uniformly in all directions from its origin. Depending on the distance and direction to the light source, the object's brightness changes. We will be discussing only point lights and the diffuse lighting model in this document. According to Lambert's law, the amount of light seen by the viewer is independent of the viewer's direction and is proportional only to cos q, the angle of incidence of light. Surfaces that exhibit diffuse reflection or Lambertian reflection appear equally bright from all viewing angles because they reflect light with equal intensity in all directions. 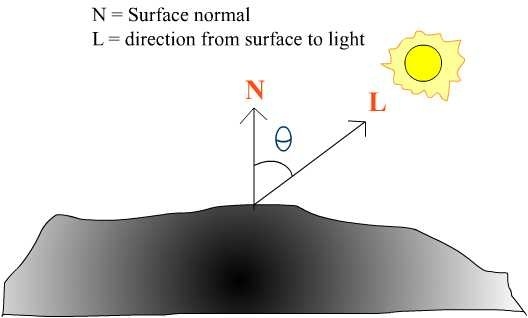 For a given surface, the brightness depends only on the angle q between the direction to the light source L and the surface normal N.
Since, point lights have position also, the distance from the surface to the light also affects the intensity. This is known as distance attenuation. Typically, the energy from the point light that hits a surface diminishes as the distance increases. Practically, inverse linear falloff doesn't look good. The inverse squared falloff looks better. In practice, this also doesn't look good. If light is far away, then its intensity is too low. But, when it is close up to the surface, intensity becomes large leading to visual artifacts. In the above equation, A0, A1 and A2 are known as the attenuation constants. As d goes to infinity, attenuation becomes very small but not zero. By varying the three constants A0, A1, A2, interesting effects can be achieved. If the light is too close to the surface, then, attenuation becomes very large, making the light too bright. To avoid this, set A0 to 1 or greater. All light colors are represented in ranges from (0.0 to 1.0), where 0 = least intensity and 1 is the maximum intensity. Every surface has a material property. Of course, the material property can be global to all the surfaces. There are different kinds of material properties like diffuse, specular, ambient, etc. The ambient and diffuse material properties determine how much light the surface reflects. Ex., If a surface has a diffuse material property of (1,0,0) corresponding to the red, green and blue components of the light respectively, then this surface reflects only the red component whereas the green and blue components will be absorbed. 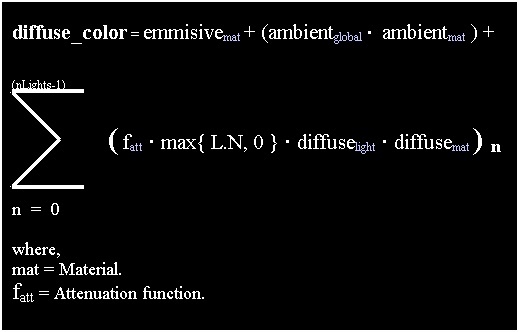 Even with the attenuation factor blending into our lighting equation, still, the maximum amount of light a surface receives is (N.L). 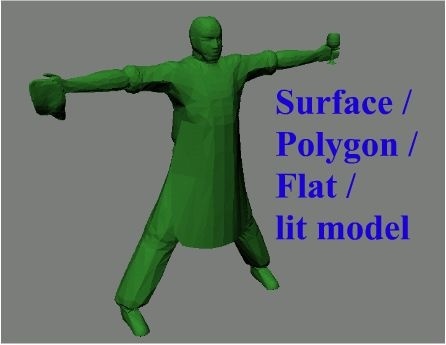 Polygonal lighting: Light intensity is calculated for each surface / polygon. Vertex lighting: Light intensity is calculated for every vertex. The intensities will be interpolated linearly across the polygon by the Gouraud shader. Let's take some time off to take a quick look at the different kinds of animation systems in practice today. This is the most primitive of the animation systems. Vertex positions (may include normals also) for all the vertices in the mesh for all the animation frames are stored in memory. This is the fastest way of animating, but its memory bandwidth is too high. It is also visually not appealing, since animation frames are jumped integrally. The intermediate positions in between animation frames are skipped totally. Also, it needs extra transition animations to switch between animations. Ex. Visualize that a character is doing a walk animation. Say, its animation is changed to sit. It would look too shabby if the animation was switched abruptly to sit from walk. So, first, an intermediate animation has to be played, and then, from intermediate to the target animation. Memory requirement of the mesh multiplies with each added animation. This is a slight improvement over the vertex based animation. The only difference is that, the vertex positions are stored only for key-frames. 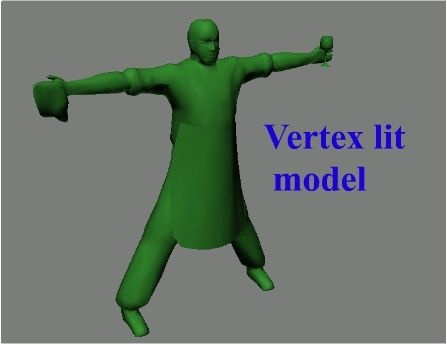 The intermediate vertex positions are computed dynamically using interpolation schemes such as linear, Hermite curve, etc. And also, the number of key frames can be slightly lesser than what it would have been with pure vertex based animation. Visually, it is slightly more appealing than pure vertex based animation, since the intermediate frames are filled in dynamically at run-time. Transition frames are not needed. Even transition is achieved by interpolation. 3D game developers are realizing that skeletal animation system is very versatile for both programmers as well as artists (actually more for the artists). Skeletal animation system consists of a series of bones which are hierarchical in nature. Mesh (vertices) or skin is attached to the bones. 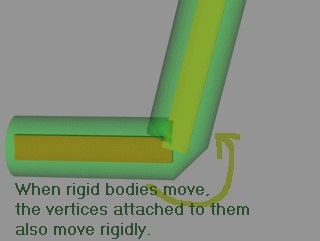 Hence, when the bones move/rotate, the vertices attached to the bone also move/rotate. Only the bone data needs to be stored for every frame of the animation. Usually, the bone data is represented by quaternions. This eliminates the need to store vertex positions for all the vertices for every frame of the animation, as in the vertex based animation. Smooth animation. We can derive intermediate frames by using spherical interpolation. Smooth transition while changing from one animation to the other. Memory bandwidth is very small. Any number of animations can be added whereas the mesh remains constant. Let's take a look at what we discussed above, in figures. The skeletal animation system looks perfect doesn't it? Well, nothing is perfect in 3D Games. Skeletal animation comes with its own set of problems. Let's study about the drawbacks of skeletal animation system with the help of some images. 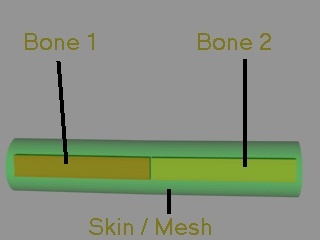 The following image shows the relationship of the skeleton / bone with its mesh. The semi-transparent object is the mesh. As you see, they are tightly coupled. When a bone moves, the vertices attached to it also move. The following image shows the same relationship as explained above. The only difference is that the mesh is shown in wire frame. The green line divides the vertices between the first and second bone. Vertices are represented by a small "+" sign. Vertices on the right are marked red indicating that they belong to the second bone, where as the vertices on the left are marked white indicating that they belong to the first bone. The following figure highlights the main drawback of the skeletal animation system. 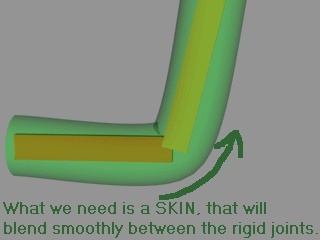 The following figure shows how the "stiffness" problem can be solved. A quantum leap isn't it? No dinner comes free. Likewise, vertex blending is not free. It adds to computational cost. Everything is moving smoothly with vertex blending. Let's move to the rough part - the math behind vertex blending. Surprisingly, the math is very simple, probably too simple. Wn = nth vertex's weight. V' = Final blended position. Let's see how we can do vertex blending for two weights. M  = array of bone matrices. id0 = First index in to the bone matrix array. id1 = Second index in to the bone matrix array. W0 = Weight corresponding to index id0. W1 = Weight corresponding to index id1. Click here to look at the C code. How can transformation, lighting and blending be achieved using the vertex shader? Till now we have only talked about vertex shaders and lighting models. Let's take a look at how they actually work. Before we start off solving the problem, we need to look at the resources that we need. I have decided to use a tesselated plane as my surface. And I have a texture that I can apply on the plane. We shall set up the plane, keeping in mind, that we also have to blend (skin) later. We do not want to come back to setting up the plane again. So we will first finish the complete initialization (position, weights, indices and texture co-ordinates) of the plane and then deal with the problem one by one. About the lights, I am using two positional (point) lights. I am assuming that the surface material has a diffuse reflection property of (1,1,1). i.e., the surface reflects all three colors with the same intensity. See Listing 1 for all the global variables, macros and structure declaration. The plane is actually built in the way as described in the figure below. The pivot is at the origin for both parts of the plane. If the pivot is not at the origin, then some extra work has to be done before rotating the planes. See Listing 2 which has the source code for the above explaination. You will find some utility functions like InitVertexBuffer and LoadTexture in the Sources Zip file. 3.Transposed world matrix from C14 to C18. 4.Transposed (View x Projection) matrix from C18 to C21. 5.Light 0 Position into C2. 6.Light 0 Attenuation into C3. 7.Light 0 Color into C4. 8.Light 1 Position into C5. 9.Light 1 Attenuation into C6. 10.Light 1 Color into C7. 11.Transposed rotation matrix for the left plane from C22 to C25. 12.Transposed rotation matrix for the right plane from C26 to C29. Why so many constants are loaded will be explained as and when they are required. Now we have the plane data ready to be displayed. Let's look at the code which sets up the vertex shader constants and calls drawpprimitive. The matrix data should be transposed before loading into the vertex shader. This is because, the vertex shader operates on row basis and our DirectX matrices operate on column basis. Note that only the final matrix should be transposed. I.e, transpose the result of (View x Projection) matrix instead of transposing view and projection matrices seperately and multiplying them (which is wrong). This is explained below. 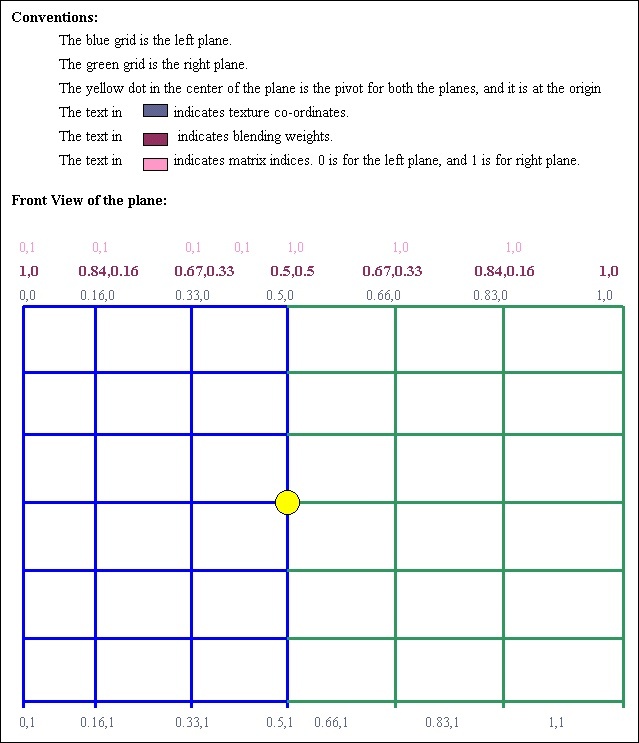 dp4 is used to multiply the vertex position with the world matrix. dp4 operates only components of a single register. It does on operate on C14.x, C15.x, C16.x and C17.x simultaneously. But it operates on C14.x, C14.y, C14.z, C14.w simultaneously. Hence we need to transpose the matrix. Also note that (View x Projection) matrix is per scene, not per vertex. Hence they are multiplied on the CPU just once per scene (GameLoop). The world (transposed) matrix is loaded seperately, since we need this for lighting calculations. Since I am using NVidia� assembler, I can use macros. I have defined some macros for loading some common constants. See Listing 3 for the common constants declaration. First, let's start off by just transforming the plane vertices into clip space and setting their texture co-ordinates. For our first solution, we need only two constants, i.e world matrix and the (view x projection) matrices (both transposed). You can ignore the loading of other constants for now. See Listing 4, which has the vertex shader to do just this. b. Set all color components to 1(i.e full intensity). c. Copy the texture co-ordinates. This involves some extra work for lighting the vertices. For this, we need the light properties which are loaded into the appropriate vertex shader constant registers. See Listing 5, which has the vertex shader to do just this. c.Transform the normal into world co-ordinates. d.Calculate the intensity at the vertex for all the given lights. Here I'm using only two point lights. e.Calculate the final intensity as a result of all the lights affecting this vertex. R0 has the transformed vertex normal. R9 has the vertex position in world co-ordinates. C2 has light 0's position. C3 has light 0's attenuation. C4 has light 0's color. 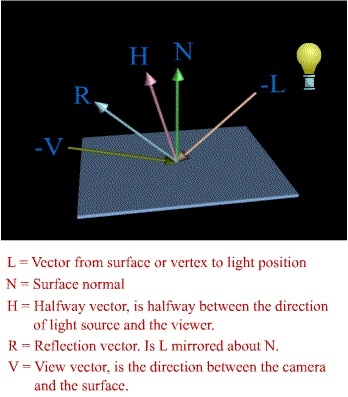 First, calculate the vector between the vertex in it's world position and the light position. Normalize R10 such that R11.xyz holds the normalized vector and R10.w holds the squared distance (d*d) between the light and the vertex. R11.w = linear distance (d) between the light and the vertex. Find the cosine of the angle between the vertex normal and the newly calculated vertex to light normal. Setup the attenuation equation in R4. Similarly calculate the attenuation fatt for the other lights (upto four) and put them in R5.y, R5.z and R5.w respectively. Put the (N.L) for the other three lights in R6.y, R6.z and R6.w respectively. Now R5 has attenuation for the four lights respectively. R6 has the intensity for the four lights respectively. However, in this sample, only two lights are being used. Hence, only the x any y components are valid. Now you can vectorize light calculations (for two lights) in this way. Lets take a look at how blending can be achieved on the vertex shader. Click here to peek into the vertex shader code. The following three lines from the vertex shader code determine the absolute offset into the matrix array which is stored as constants. r0 will hold the absolute offsets into the four blending weights. Of course, here we are using only two. The rest of the code does implement the blending equation. This vertex shader just transforms the plane by applying their respective rotations. It neither blends nor lights it. This vertex shader blends the mesh and also lights it. For lighting, even the vertex normals have to be blended. Notes on using the PlaneBlend.exe. "Up Arrow" and "Down Arrow" to pitch. "Left Arrow" and "Right Arrow" to yaw. F1 and F2 to rotate the left plane on Y axis. F3 and F4 to rotate the right plane on Y axis. Press one of the following keys to change the shader. 3 = Vertex blending with no light. 4 = No vertex blending and no light. 5 = Vertex blending with light. The static sphere kind of an object that you see is the light source. The light object takes (only) the color from the light source itself. Choose [Properties...] from "Light" menu to change light settings. You can use [Ctrl+L] shortcut key for this. Choose [Change display mode...] from "Display Options" menu to change display settings. You can use [Ctrl+D] shortcut key to do this. Choose [Light...] from "Display Options" menu to toggle light on the world. This option will be saved when you exit the application. Changing Light properties: Press [Ctrl+L] to invoke the light menu. In full screen mode, sometimes the dialog box is not displayed and the action stops. Press escape once and try again. You have full control over the light properties. You can select a light by using the mouse. Move the camera until the light object (sphere) is in view. Click and hold the left mouse button down and form a rectangle around the light source. When selected, the light source appears in wireframe. You can also see three lines indicating the three axis. Red line is for X-axis, Green line is for Y-axis and Blue line for Z-axis. When a light is selected and if you select "Light Properties", then, the properties for the currently selected light are shown. When selected, you can move the light by pressing the following keys on your keyboard. Make sure NUMLOCK is on. Numpad4 and Numpad6 to move along X-axis. Numpad8 and Numpad2 to move along Y-axis. Numpad7 and Numpad1 to move along Z-axis. Keep key pressed to move lights faster. The light properties are standard DirectX light properties like attenuation, position and color. All lights are positional (point) in nature. What does the future hold for 3D games with the power of the current and future generation graphics cards and features like programmable pipe line? The introduction of DirectX 8 and graphics chipsets like GEForce3 has been like an oasis in the desert for game developers. Finally we have something that is so exciting, powerful and mind blowing that we can start thinking (and making) games that are movie like. What can you expect from future games using these technologies? Photo realistic textures which make the game look like a real life environment. With > 64MB of video memory on the card, artists can pump up the texture sizes to such an extent that it would have been unthinkable 18 months back. The buzz word for texture artists is "BIG is better". Much better AI, since most of the other stuff will be handled by the GPU. True real-time dynamic lighting with features such as per-pixel lighting, bump mapping, etc. True dynamic shadows and not blob shadows. At last characters that look REAL in real-time. Higher order surfaces result in a much smoother "Curved" world. GPU is exciting isn't it? But, sometimes even the GPU might get clogged since we are off loading all the calculations from the CPU and loading them onto GPU. It's not a very good idea to let the GPU do everything. So, it's up to the game designers to strike a right balance between the CPU and GPU. Now, the CPU has become the bottle neck as far as speed and performance is concerned. No CPU can match the speed and performance of the GPU. It's a good idea to get the right balance on the hardware front also. A Pentium I MMX 300MHz and a TNT graphics card combination is much better balanced than the same CPU with a GEForce3. I would like to thank Richard Huddy of NVidia whose articles on vertex shaders inspired me to compile this article. Some diagrams/images w.r.t vertex shaders are originally from his article. Prior to joining Dhruva in 1998, Keshav worked on embedded systems using VxWorks.